Many widgets, like buttons, do all their drawing themselves. You just tell them the label you want to see, and they figure out what font to use, draw the button outline and focus rectangle, etc. Sometimes, it is necessary to do some custom drawing. In that case, a Gtk_Drawing_Area might be the right widget to use. It offers a canvas on which you can draw by connecting to the "draw" signal. The contents of a widget often need to be partially or fully redrawn, e.g. when another window is moved and uncovers part of the widget, or when tie window containing it is resized. It is also possible to explicitly cause part or all of the widget to be redrawn, by calling Gtk.Widget.Queue_Draw() or its variants. GtkAda takes care of most of the details by providing a ready-to-use cairo context to the ::draw signal handler. -- button press and motion notify events that want to handle. -- in one go, by calling Win.Show_All. -- that are contained in the window, directly or indirectly. -- until Gtk.Main.Main_Quit is called. -- a GdkEventMotion struct which contains this information. -- or clearing the surface, depending on which button was pressed. -- struct which contains this information. -- right button in a left-handed setup. -- left button in a left-handed setup. -- We've handled the configure event, no need for further processing. -- Now invalidate the affected region of the drawing area. This program is more complicated and it shows a problem with the current GtkAda (3.8.3) binding. There is no button definition for GDK_BUTTON_PRIMARY and GDK_BUTTON_SECONDARY, etc., which have to be defined in package draw_cb ourselves by taking the definition from the gtk-3.0/gdk/gdkevents.h. As of 2013-03-26, the SVN source tree has been updated after I reported the bug, it now contains the button definitions in gdk-event.ads as Button_Primary, Button_Secondary and Button_MIddle, if you are using the SVN source after the day, you may want to use that definition directly. The cairo surface variable is defined in the draw_cb package body, it has the similar effect of the C static definition that only procedures and functions in the package body could see it. We use use type Cairo.Cairo_Surface; in the draw_cb package body, so that /= and = could be used directly on the type without exposing other Cairo definitions. When constructing a more complicated user interface, with dozens or hundreds of widgets, doing all the setup work in Ada code is cumbersome, and making changes becomes next to impossible. Thankfully, GtkAda supports the separation of user interface layout from your business logic, by using UI descriptions in an XML format that can be parsed by the Gtk_Builder class. This example is exactly like the grid example, but using the Gtk_Builder class. Note that Gtk_Builder can also be used to construct objects that are not widgets, such as tree models, adjustments, etc. That is the reason the method we use here is called Get_Object and returns a Glib.Object.GObject instead of a Gtk_Widget. That is why we need to cast the return value of Get_Object to the corresponding type to pass the compilation. Normally, you would pass a full path to Add_From_File to make the execution of your program independent of the current directory. A common location to install UI descriptions and similar data is /usr/share/appname. It is also possible to embed the UI description in the source code as a string and use Add_From_String to load it. But keeping the UI description in a separate file has several advantages: It is then possible to make minor adjustments to the UI without recompiling your program, and, more importantly, graphical UI editors such as glade can load the file and allow you to create and modify your UI by point-and-click. When creating an application, you'll want to put more than one widget inside a window. Our first helloworld example only used one widget so we could simply use Add call to "pack" the widget into the window. But when you want to put more than one widget into a window, it it becomes important to control how each widget is positioned and sized. This is where packing comes in. The following example shows how the Gtk_Grid container lets you arrange several buttons. It follows the same directory structure in the helloworld example. -- you don't want the window to be destroyed. You may notice the callback functions are exactly the same as helloworld, you could reuse it by just rename the packages or simple using the same hello_cb package and in grid.adb with and use it with hello_cb; use hello_cb;, then you don't need to change anything on the call backs. There is not much resources on how to program with GtkAda. GtkAda User’s Guide provides some information but not enough to start from scratch. I tried to follow the Getting Started with GTK+ but writing it with GtkAda. I will assume you have gnat gpl 2013 and GtkAda installed. I use the svn version of GtkAda (3.8.3) in stead of the GtkAda 2013 GPL 3.4.2. We'll start with the simplest program possible. This program will create an empty window. All GtkAda application will, of course, with the Gtk.Main and Gtk.Window packages. We'll need to add a call back to quit the program, so with the Main_quit procedure. In the main procedure Hello, we declared a Win variable as of type Gtk_Window. Since we have use Gtk.Window, we does not need to give the full path as Gtk.Window.Gtk_Window. The following line will call Gtk.Main.Init, which is the initialization function for GtkAda; it calls the underline gtk_init() function and will setup GtkAda, the type system, the the connection to the windowing environment, etc. The Gtk.Main.Init take care of passing command line arguments counter and string array to the C gtk_init() function; this allows GTK+ to parse specific command line arguments that control the behavior of GTK+ itself. The parsed arguments will be removed from the array, leaving the unrecognized ones for your application to parse. For more information on which command line arguments GtkAda recognizes, please refer to the Running GTK+ Applications section. A call to Gtk_New (Win) will create a new Gtk_Window and store it inside the Win variable. Gtk_New has Gtk.Enums.WindowToplevel as its default The_Type argument, so we don't need to specify it with the call. Which means the the Gtk_Window will be managed by the windowing system: it will have a frame, a title bar and window controls, depending on the platform. This function will terminate the GtkAda main loop started by calling Gtk.Main.Main later. The "destroy" signal is emitted when a widget is destroyed, either by explicitly calling Gtk.Widget.Destroy or when the widget is unparented. 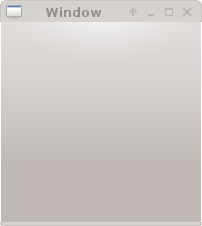 Top-level Gtk_Windows are also destroyed when the Close window control button is clicked. Gtk_Window are hidden by default. By calling Win.Show_All, we are asking GtkAda to set the visibility attribute so that it can be displayed. Al this work is done after the main loop has been started. The last line of interest is the call to Gtk.Main.Main. This function will start the GtkAda main loop and will block the control flow of Hello until Gtk.Main.Main_Quit is called. While the program is running, GtkAda is receiving events. These are typically input events caused by the user interacting with your program, but also things like messages from the window manager or other applications. GtkAda processes these and as a result, signals may by emitted on your widgets. Connecting handlers for these signals is how you normally make your program do somthing in response to user input. In the main_quit procedure, Gtk.Main.Main_Quit is called to quit the program. The following example is slightly more complex, and tries to showcase some of the capabilities of GtkAda. -- ask it to call the on_delete_event() function as defined above. -- it will destroy the Win when button is clicked. -- which is a special container that can only have one child. This time, we defined a hello_cb package to host all the call back functions. In GtkAda, there is no need for g_signal_connect_swapped(), we use the Widget_Callback.Object_Connect method. P.S. All source code from these series of Getting Started with GtkAda are now at GitHub. If this Google Watch could function independently as a phone without a pairing smart phone, I will immediately get one when its out. If it needs a pairing smart phone then forget it!